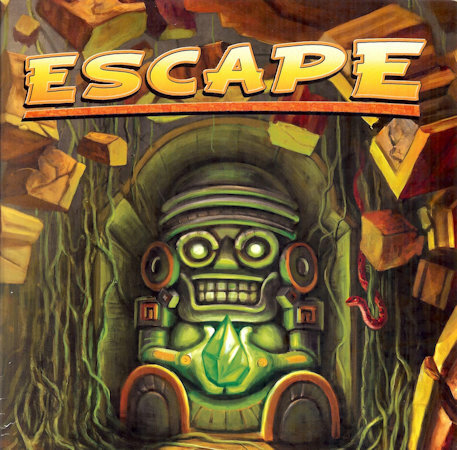 The players are explorers in a cursed temple, each armed with nothing but five dice to help them through the maze of rooms. Simultaneously, players roll their dice in an effort to get different combinations of symbols. 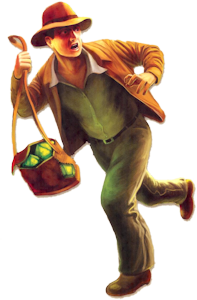 The correct combinations allow you to perform different actions such as moving to a new room or picking up the magical green gemstones that will break the curse and allow everyone to… Escape! Didn’t get the combination you wanted on your roll? Then pick up your dice and immediately roll them again, as often and as quickly as you can, all the while shouting out info to your team-mates: “I’ve found a new room”, “I’m stuck in a trap, help!”. This continuous, simultaneous action is part of what makes the game exhaustingly fun. The genius addition, and the reason for the CD soundtrack, is that every couple of minutes a gong sounds. This marks the start of a countdown where all players have to rush back to a safe room or lose one of their precious dice. The heart-beat soundtrack is simple but nicely produced and really builds the tension as everyone makes a desperate dash for safety. This is not a game you’ll be playing all the time, but it is great for small parties or family gatherings, making it a good Christmas gift (which is how I received it). Sadly, a little online searching suggests that the original game is no longer being produced and second hand sellers are charging a premium for it. There is a newer, Kickstarter-backed version called “Escape Zombie City” which may be worth looking out for if zombies are your thing.